In Need of Vintage Wedding Theme Ideas? If you feel a vintage wedding theme is suitable for you then we have unique wedding ideas for you to consider. Find everything you need to know and choose your own antique look. Vintage weddings are actually one of the most popular trends nowadays. This type of bouquet is ideal for brides that want a creative style that will photograph perfectly and create memories for years to come. 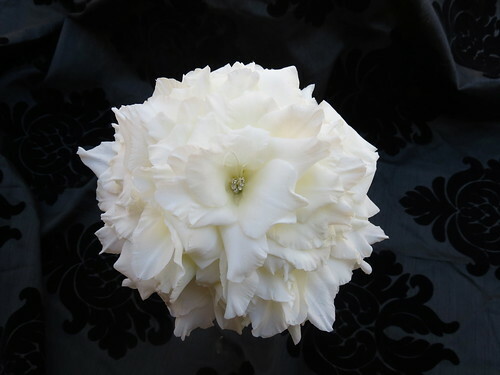 Also known as a glamelia, and traditionally created with roses and/or gladioli petals, this bouquet creates the illusion of a supersized single flower. A 1940s inspired event is an elegant affair. Wouldn’t you love to go back in time to the Big Band Era for one day? When the music was fun and loud, and parties were even louder! When dancing the night away was more than just a saying? I know you are daydreaming about it by now—who wouldn't? Celebrations with a look from years long gone are one of the hottest trends in wedding industry. And one of the most popular vintage wedding themes that brides select nowadays is that of the 20's. If you are trying to have a glamorous yet fun wedding with a retro look, you are going to love Adam and Vicky’s wedding ideas. Do you love the look and feel of the early 1900's? If you do, you're not the only one! The first step in designing a vintage wedding is to think about what vintage means to you. I think about those sepia colored photographs, cameos, pearls, and long fitted satin dresses. But maybe when you think of it you imagine corsets, the 1940's, just pre-war and Frank Sinatra's music playing in the background. Vintage wedding is a broad subject and you need to find which theme most allures to you. If your favorite decade is the early 1900's then check out the 1940 and 1920s theme wedding below. Or maybe you'll enjoy the Hollywood glamour wedding theme as the perfect scenario for your wedding. Click on any of the 16 photos above to find you perfect wedding theme. Remember no matter what you decide, the most important thing on your wedding day is that you feel comfortable and at ease. So prepare in advance and everything will go as planned. No matter what your budget is, having a vintage wedding theme is very affordable. To give the special touch to your reception just make sure to pay attention to detail. It's all about you and celebrating the love that you found in a unique way. Don't forget you can ask all of your vintage wedding theme questions here. Or Check out Modern Wedding Ideas for inspiration and styling for all things about vintage English weddings.